New weekend and summer home in a New England seaside community. Terrace Level: 1,279 sq. ft.
First Floor Level: 2,561 sq. ft.
Second Floor Level: 942 sq. 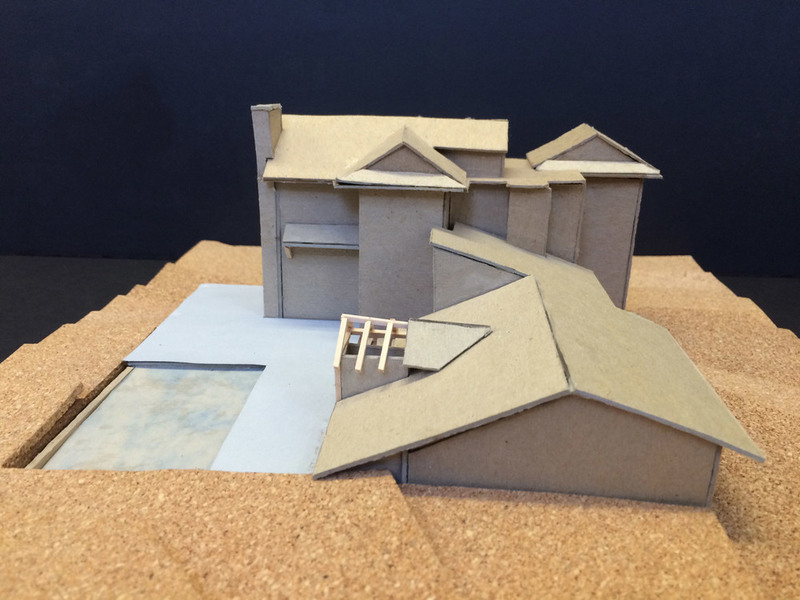 ft.
We know this client because he built two homes that we designed for a third party (Little Sea). 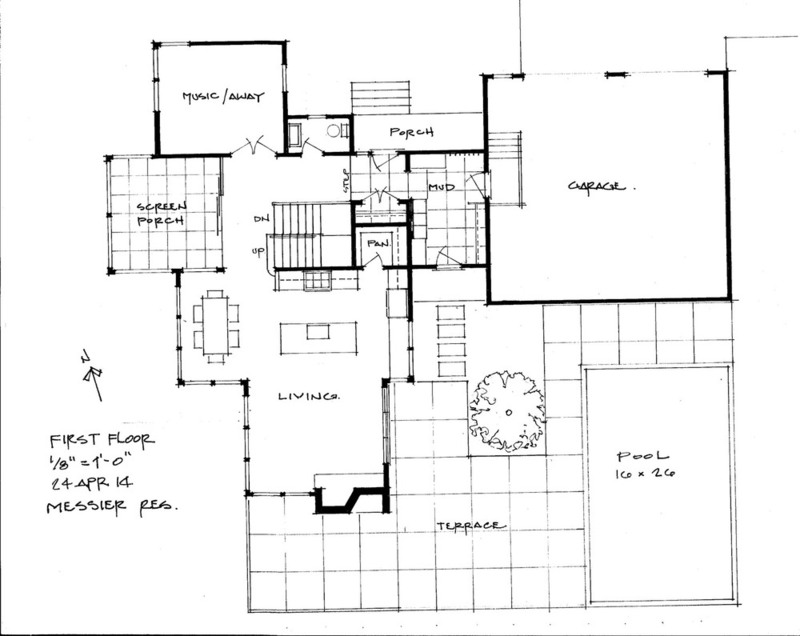 We are honored that this experienced and accomplished General Contractor asked us to create a new second home for him. The lot is narrow, sloping up from a quiet seaside lane. The program is for a modest, three bedroom home and pool area designed for entertaining. An interesting challenge with this site is the relationship between the views and the outdoor spaces versus the road, driveway, entry, and desire for some privacy because the front, street facing façade is also the primary view façade. To address this we sited the house up the slope at the back of the lot. We ran the driveway tight to the north lot line to access the garage located in the north-east property corner. The entry is on the north side in an east-west wing running between the garage and the house. To create privacy from the road, we put the pool in the south-east corner, partially behind the house but with its terrace and view corridor out to the water along the south setback line. The resulting area remaining for the home is quite narrow so we stacked its rooms in three levels with major view windows on the south and west facades. 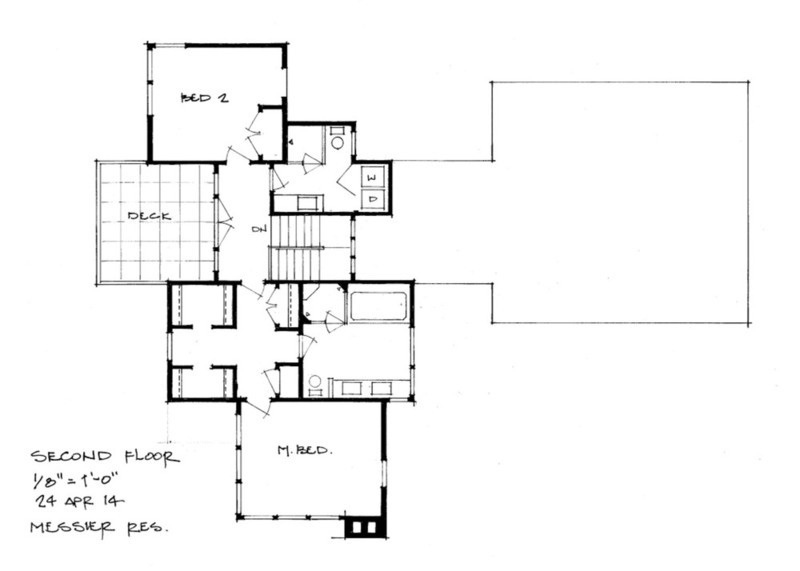 The three floor plans are organized around a central outdoor space at each level: a terrace at the lower Terrace level, a screened-in porch at the First Floor level, and a deck at the Second Floor level. Elevated at the back of the lot, away from and above the road, they each have south, west, and northwest exposure and views. The other major outdoor space is the pool terrace with east, south, and west exposure. The centrally located open stairway brings morning light into the first and second floor hallways.